A North Carolina family traveled more than 700 miles to the Clearwater Marine Aquarium to meet the beloved dolphin. CLEARWATER, Fla. -- Winter, the famous dolphin, is still working her magic. 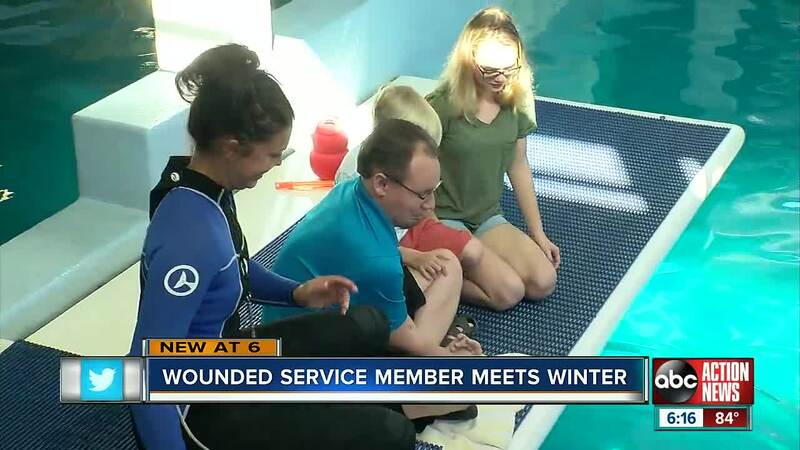 A North Carolina family traveled more than 700 miles to the Clearwater Marine Aquarium to meet the inspiring movie star. “With a little love anything is possible,” said Ed Edmunson. Edmunson added that’s one of the many lessons he and his family learned after watching Dolphin Tale. “I watched the movie about five times. Hunters probably watched it about six,” said Gracie Edmuson. But the family’s journey started long before seeing the movie or traveling to meet Winter in person. U.S. Army Sgt. Eric Edmunson was severely injured while serving overseas. An IED blew up, rupturing his spleen, breaking his knee and his back. The incident left the husband and father with traumatic brain injuries. Today, he was able to shake fins with one of his motivators. “We work really hard to keep this nucleus together and help Eric so that he can be a loving participating father,” Ed Edmunson said. His children, Gracie and Hunter, were also able to see Winter and witness their own father connect with one of his motivators. “I got splashed,” Gracie said. This isn’t the first time Edmunson has made headlines. To provide support to his fellow wounded soldiers, Edmundson has learned how to paint with the help of a device that allows him to hold a brush. The proceeds from the paintings Edmundson creates are given to help his fellow vets have meaningful and healing experiences.